All 50 mile distances are AHA recognized. 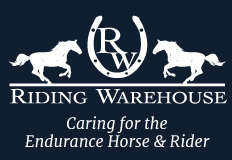 Donating awards, and offering a few special prizes: 1 free hoof trim (all 4), and a 4 hour riding clinic. There will be a drawing from Day 1 ride entries for the trim, and a drawing for the clinic on Day 5. Plus GEC will hold a free Question and Answer hour (from 5 to 6 pm - changes will be posted) each afternoon of the first 4 days. Anybody can go to the GEC trailer with or without horses and pick Christoph and Diane's brains regarding any issues: training, conditioning, saddle fitting, nutrition, FEI, hoof trimming, shoeing and protective boot application. 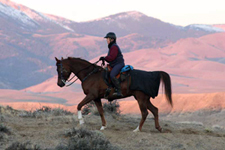 Come ride the historic trails of Southwest Idaho's rugged Owyhee country! Ride all day and come back for a hot shower, happy hour in the shaded yard, and a hearty Idaho dinner by Blue Canoe Catering. Sleep under the starry skies, and ride again the next day! (or maybe just relax and enjoy the late summer sun...) . Breakfast, Lunch & Dinner will be available all week! Dinner (after the ride) is free with ride entry, breakfast and lunch may be purchased beginning on Monday. Blue Canoe Catering is providing all meals. Registration will be available soon! 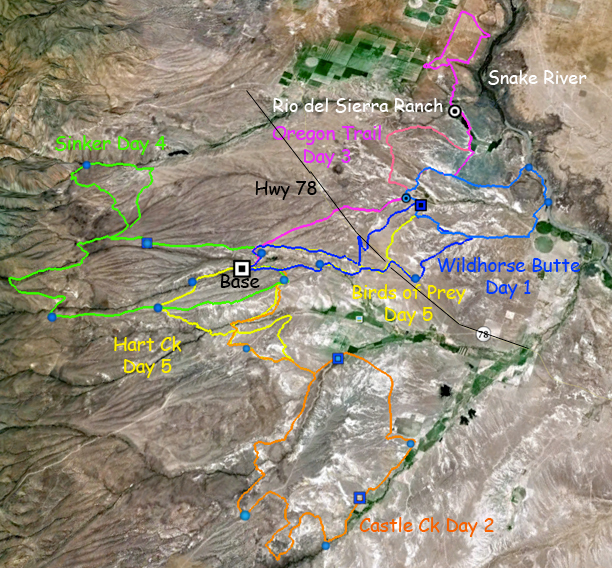 5 day overview map - Current for 2010 Most of the trails will be similar to 2009, but we won't do Alder Creek (too rocky for a 5-day!) and we're making some changes to Day 2 Castle Creek - less rock, less road! 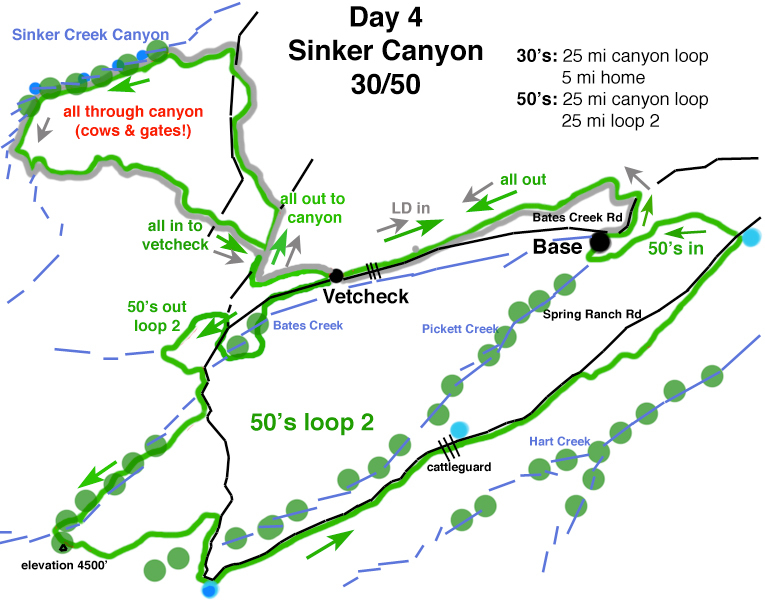 Days 1 - 4 LD's and 50's will all have big loops and out vet checks, returning to camp at the end of the day. Day 5 50's will have two 25 mile loops, with a 1 hour hold in camp. 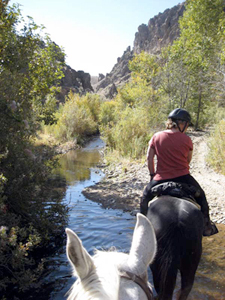 We're taking you farther out each day to experience more of the incredible Owyhee country. This is rocky country, so pads or hoof protection is highly recommended. This is not a difficult ride and there are no huge climbs, but there are plenty of slow and technical trail sections - just take your time and enjoy! 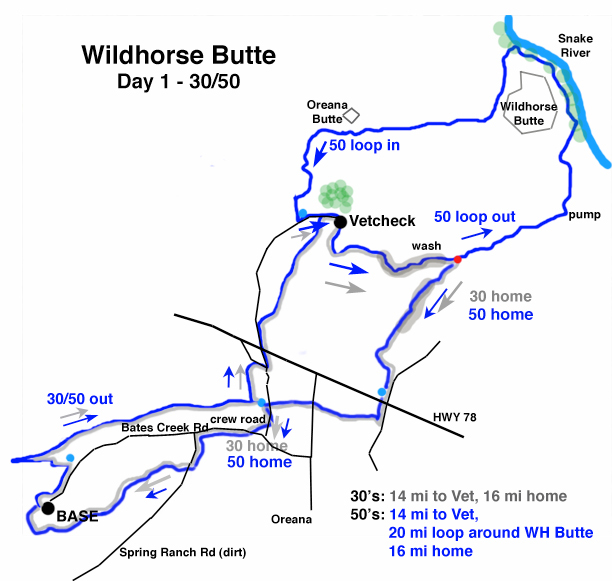 Day 1, Tuesday, Wild Horse Butte. 50 miles, 30 miles. 50's: Mostly good footing. 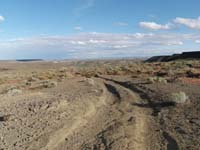 Some sandy stretches, minimal rock, some single track, some washes, lots of dirt road (Oregon Trail) with good footing. Single track trail along the Snake River, around Wild Horse Butte. Two out vet checks, both in same location at the end of Ryepatch Rd. 30's: Fairly easy trail, good footing, single track and dirt roads, one out vet check. Day 2, Wednesday. Castle Creek Canyon. 50 miles and 30 miles. 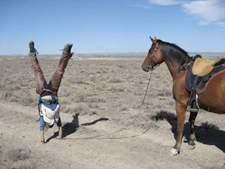 50's: Very scenic, classic Owyhee Desert ride, canyons and washes and some rocky ridge trails - ride along Browns Creek drainage, above Castle Creek Canyon, and then through the canyon to an outcheck at Collette's TX Ranch. Moderate to easy in difficulty. There are a few very rocky technical sections in the morning. Otherwise, decent footing, some short rocky stretches, ranch roads, single track through canyon area. One out vet check half-way. 25's: Fairly easy trail, with minimal rock, but some sections of sand wash. One out vet check. You will cross Hart Creek and ride the trails on the south side of Triangle Road. .
Day 3, Thursday. Oregon Trail. 50 miles and 30 miles. Map: (current for 2010) dowload pdf file || view as jpg! 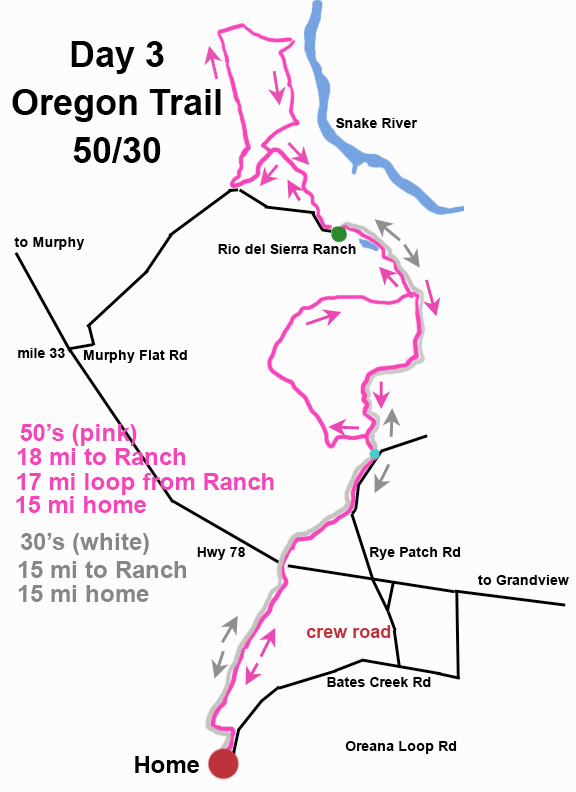 50's: Ride south to the Snake River along sections of the Oregon Trail. Vet check at the Sierra Del Rio Ranch (one of the original stops along the Oregon trail). Ride west out of the ranch along Oregeon trail, wagon ruts still visible in the stone crossings. A 20 mile loop with a few scenic overlooks above the Snake River. Return to Sierra Del Rio for another vetcheck, and return to camp. Mostly good footing, a few short scattered rocky areas. 30's: Fairly easy 'out and back' trail, with minimal rock. One out vet check at the Sierra Del Rio Ranch. Day 4, Friday, Sinker Creek Canyon. 50 miles, 30 miles. 50's: new return trail for 50's (same as 2009). Moderate difficulty, very scenic! VERY rocky as you ride through canyon for 5 miles. Cows/calves and low branches in canyon - no trotting through here! But take your binoculars and camera - raptor nests in canyon walls, great rock formations, pretty trail! One out vetcheck. Head back west to return, ride the old irrigation canal to Bates Creek, take a new trail up Bates Creek canyon, then return cia Spring Ranch Rd and circle back to camp. 30's: Ride through Sinker Canyon, one out vet check on Bates Creek Rd. Day 5, Saturday, Hart Creek & Birds of Prey. 50 miles, 25 miles. 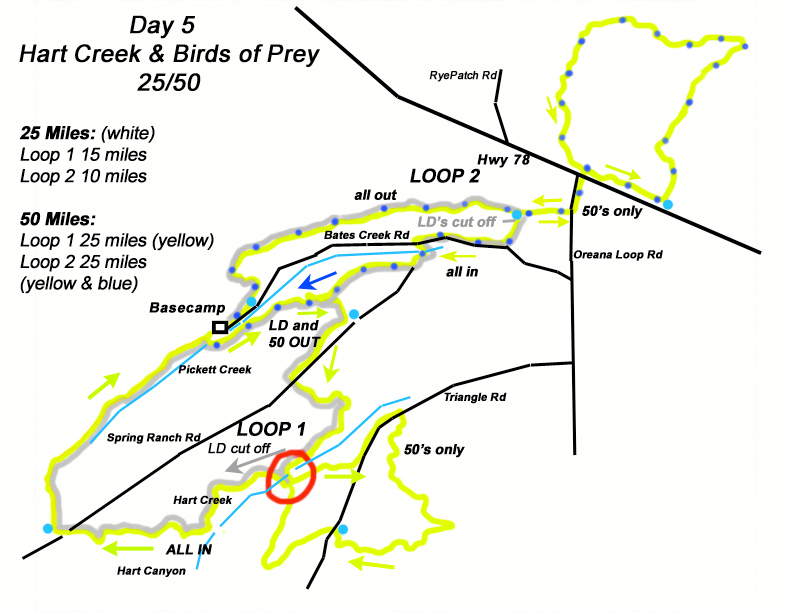 Day 5, Saturday, Hart Creek Canyon // Birds of Prey 25/50, and Trail Ride. 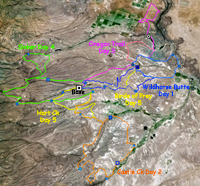 We'll use the same trails we used on Day 2 of the Fandango: ride two large loops; south of camp into the rugged Hart Creek drainage, and north of camp to the Birds of Prey area with soft trails and sand washes. One half-way hold in camp. 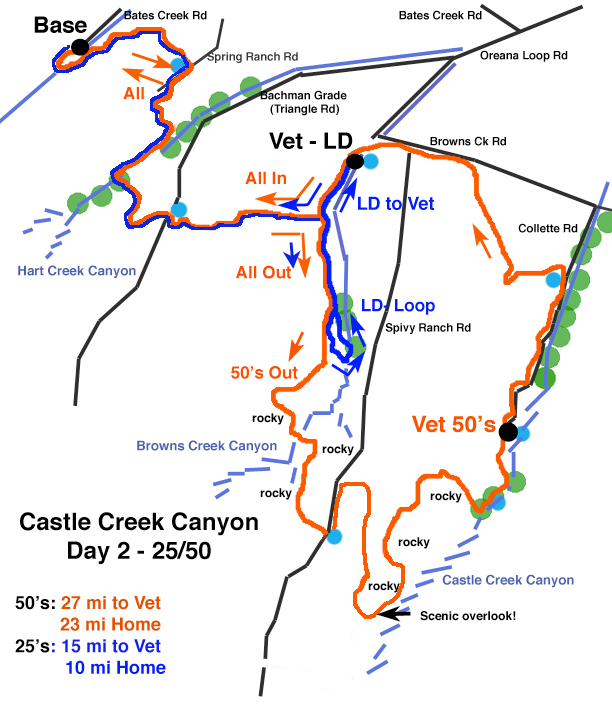 50's: Two 25 mile loops with one vetcheck in camp. Moderate trail, some climbs and rocky sections. Ride past the old homestead on Hart Creek, and along the rim above Hart Creek Canyon. Very scenic. Mixed footing - some sand, a rocky climb out of the canyon, fairly technical trail in places. Loop 2 takes you south of the Highway, into the Birds of Prey - some fun single track trail and washes, easy trail with good footing. 30's: One vet check in camp. Fairly technical trail, some climbs and rocky sections. The first loop is very scenic. Loop 2 is easy, and will get you done! Normal high temperatures (for Boise) are in the mid 70's. Normal low temperatures are in the upper 40's. It is typically dry and sunny, though showers are possible. Ten day forecast and monthly averages. That is what I find, the quiet is deafening, the sky is endless, and time stands still, this is where trail/horse/rider all truly become one.